Lehmann 25” x 130” Hollow Spindle Lathe w/ 12” Thru Spindle Bore, 8-308 RPM, Taper Attachment, InchThreading, Tailstock, (2) 24” 4-Jaw Chucks. Lehmann No. 32 Hydratrol 35” x 380” Dual Table Lathe s/n C-596 w/ 4-160 RPM, (2) Cross Slide Turning Beds with Taper Attachments, Inch Threading, Tailstock, Steady Rest, 28” 4-Jaw Chuck. Summit mdl. 26-4X200 33” x 214” Gap Bed Lathe s/n 770518 w/ 14-1010 RPM, 4” Thru Spindle Bore, Taper Attachment, Inch/mm Threading, Tailstock, Steady Rest, 30” 4-Jaw Chuck. Graziano Tortona “SAG 22” 22” x 104” Gap Bed Lathe s/n 91796 w/ 60-1500 RPM, 3 ¼” Thru Spindle Bore, 30” @ Gap, Inch/mm Threading, Tailstock, 15” 3-Jaw Chuck. Sharp mdl. 2480K 24” x 80” Geared Head Gap Bed Lathe s/n 9439 w/ Sony DRO, 25-1200 RPM, 4” Thru Spindle Bore, Inch/mm Threading, Tailstock, Steady and Follow Rests, 18” 4-Jaw Chuck, Coolant. Victor mdl. 2080 20” x 80” Geared Head Gap Bed Lathe s/n 710257 w/ 31-1500 RPM, 3” Thru Spindle Bore, Inch/mm Threading, Tailstock, 16” 4-Jaw Chuck, 12” 3-Jaw Chuck, Coolant. Lodge &amp; Shipley 18” x 180” Lathe w/ Taper Attachment, Tailstock, (2) Steady Rests. Mori Seiki MS-1250 17” x 56” Geared Head Gap Bed Lathe s/n 6561 w/ 32-1800 RPM, Inch Threading, Tailstock, 12” 3-Jaw Chuck. 2001 Servo mdl. SV50V 3-Axis CNC Vertical Mill s/n 11820 w/ Servo CNC 2000 Controls, Servo II Hand Controller, 3Hp Motor, 60-4200 Dial Change RPM, Power Drawbar, 10” x 50” Table. Lagun Vertical Mill s/n 4717 w/ Mitutoyo KA Counter DRO, 55-2940 RPM, 8-Speeds, Power Feed, 4” Riser, 9” x 48” Table. Lagun Vertical Mill w/ Fagor Innova Programmable DRO, Power Feed, 10” x 50” Table (NEEDS WORK). Mitts &amp; Merrill No. 5 Broaching Machine. Elgin mdl. B 18” Rotary Surface Grinder w/ 19” Magnetic Rotary Chuck, 12” Grinding Head. Pacific mdl. 600G12 ¾” x 12’ Hydraulic Power Shear s/n S11072 w/ Controlled Back Gaging, Foot Control. Uni-Hydro mdl. 120-24 120 Ton Hydraulic Ironworker s/n3P12066X w/ 2 ½” thru ¾”, 1 ½” thru 1” Punch Cap., 24” Shear Cap., 6” x 6” Angle Shear, 6” x 2” Channel Shear, 3” x 3” Coping Notcher, 6” x 6” Corner Notcher. Koike Sanso-Kogyo Type IK1500E CNC Burning Table w/ Burny 2.5 CNC Controls, Burny ETEK Tracer Unit, (1) Torch Head, (1) Plasma Head, 76” x 134” Table Cap. Milles &amp; Jones No. O 72” Power Roll w/ 5” Lower Roll, 6” Upper Roll. Cincinnati Hypro 150” Twin Head Vertical Boring Mill s/n 56 w/ (2) Facing / Boring Heads Indexable to 45 Degrees, Facing / Turning Head, Power Feeds, 150” Chuck. 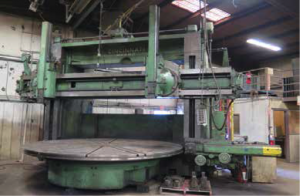 Niles 96” Twin Head Vertical Boring Mill s/n 16983 w/ (2) Facing Boring Heads ( ONE NEEDS REPAIR ),102” Swing, 96” Chuck. Giddings &amp; Lewis Type 340-T Horizontal Boring Mill s/n 150-184- 56 w/ Sony LH52 and LH51 DRO’s, 10-1300 RPM, 4” Spindle, 45-Taper Spindle, Power Feeds, 48” x 134” Table. Ikegai Horizontal Boring Mill w/ Newall DRO, 39” x 43” Indexing Table (DISASSEMBLED FOR REPAIRS). Bullard 50” Vertical Turret Lathe s/n 16037 w/ 5-Station Turret Head, Facing / Turning Head, 56” Swing, (NEEDS REPAIR). Mitutoyo OD Mics to 36”. Mitutoyo 2”-4” Dial Bore Gage. Mitutoyo and Pittsburg Digital Calipers. Mitutoyo and Kanon 40” Vernier Calipers. 2011 Ford F-350 4X4 12’ Stake Bed Truck Lisc# Y988HN w/ 6.7L Power Stroke B20 Diesel Engine,Automatic Trans, AC, 40,198 Miles, VIN# 1FDRF3HT2BEC68006. 2009 Ford F-150 XL 4X4 Pickup Truck Lisc# W295FJ w/ 4.6L Gas Engine, Automatic Trans, AC, 73,561Miles, VIN3# 1FTPF14859KB75462. 2013 Ford C-MAX Hybrid Car Lisc# Y646SH w/ Hybrid Engine, Automatic Trans, VIN#1FADP5BU2DL5022688. Pettibone 36MK 36,000 Lb Cap 28’ to 64’ Boom Truck w/ Outriggers. Hyster H155 XL2 13,900 Lb. Cap Diesel Forklift s/n G006V03921D w/ 2-Stage Tall Mast, 212” Lift Height,Side Shift, Controlled Forks, Yard Tires. 1991 Maxey 5 th Wheel Trailer Lisc# 56786K w/ 24,000 Lb Cap, VIN# MM9FG2075M1SE2692. (3) 40’ Shipping Containers. Miller Dimension 652 CC/DV-DC Arc Welding Power Source s/n KF910541. Lincoln Idealarc R3S-600 CV-DC Arc Welding Power Source s/n AC472240. Miller XMT456 CC/CV DC Inverter Arc Welding Power Source s/n MB300018A w/ Lincoln LF-72 WireFeeder. Miller XMT450 CC/CV Arc Welding Power Source s/n MD020786U. Lincoln PowerWave 455 Arc Welding Power Source s/n U1970107380 w/ Lincoln Power Feed WireFeeder. Lincoln Idealarc R3S-400 CV-DC Arc Welding Power Source s/n AC313206. Lincoln Idealarc R3R-400 DC Arc Welding Power Source s/n AC427330. Lincoln Square Wave TIG-355 Squarewave AC/DC TIG and Stick Welding Power Source s/n U1971007260/ Lincoln Magnum System Monitor / Cooler. Lincoln Invertec V350-PRO Inverter Arc Welding Power Source s/n U1030503982 w/ Lincoln LN-7 Wire Feeder. Miller XMT350 CC/CV Auto-Line Arc Welding Power Source s/n LJ310225A w/ Lincoln LN-7 Wire Feeder. Miller Shopmaster 300 AC/DC Arc Welding Power Source s/n KF869150 w/Lincoln LF-72 Wire Feeder. PowCon 375 Amp Welding Power Source w/ Lincoln LN-7 Wire Feeder. Esab MIGMaster 250 MIG Welding Power Source. Lincoln Idealarc 250 AC/DC Stick Welder. Thermal Dynamics PakMaster 100XL-Plus Plasma Cuting Power Source. Koike Sanso Kogyo “Cir-Cut- 11” Circle Torch. Esab Type CM-79 Track Burner w/ Track.